Currently, 47 out of 50 states in the U.S. allow parents to make decisions regarding administering vaccines to their children, by providing religious and philosophical exemptions. California joined West Virginia and Mississippi in 2015 by removing these exemptions, despite widespread opposition by the public, doctors, and scientists who are not among the vaccine extremists. While it is too early to tell how increased childhood vaccination rates in California will affect childhood health outcomes, West Virginia and Mississippi have some of the worst childhood health outcomes along with high vaccination rates. 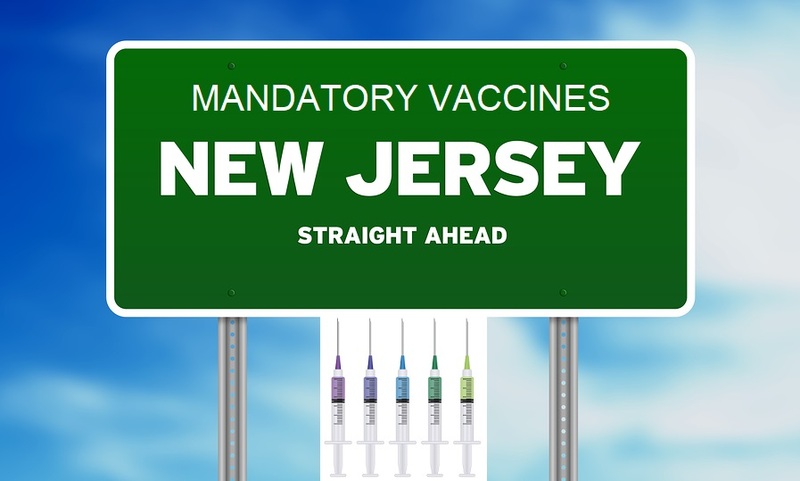 Now, vaccine extremists in New Jersey want to follow these states and restrict parental choice by passing legislation that restricts conscientious objections to vaccines. This is seriously NOT OKAY. Violation of bodily integrity, of a person or their child, is NOT OKAY. Violation of a person's spiritual beliefs, along with violation of their body is NOT OKAY. And forcing persons to participate in vaccine DAMAGE/ DEATH ROULETTE, for "herd mentality" is NOT OKAY either. These are EXTREME HUMAN RIGHTS VIOLATIONS. This is so very much now a world filled with demonic propaganda - and harmful stupidity, in the name of FALSE "knowledge" - to match!! Long ago, demonic Romans tried to force-feed blood sausage to early Christians - and the penalty for NOT taking this into their body was to be demonically destroyed in the Roman Collesiums, for the EVIL pleasure of DEMONIC persons. Now, during these last of the pre-Armageddon days, godless, foolish, and conscience-defunct persons are again evilly choosing to make themselves slave-tool-hordes of the Devil - dementedly once again attempting to work INEXCUSABLE ABUSE OF POWER, to try to FORCE VIOLATION of the bodily and spiritual integrity OF THOSE WITH INTEGRITY (to God). Back in the day, I refused, by conscience/ spiritual beliefs, to go with the common practice of having my kids vaccinated with a hepatitis vaccine grown on blood. For anyone to have forced that would have been the same as demon-influenced Roman officials demanding a true Christian to either eat the blood sauage or undergo the life-destruction the evil VIOLATOR had in mind. FORCED VACCINES are AN UNACCEPTABLE, GROSS VIOLATION OF HUMAN RIGHTS - A CRIME AGAINST GOD and HUMANITY. They are also SCIENTIFICALLY and MEDICALLY NEGLIGENT and STUPID; and are DESTRUCTIVE towards HOLISTIC CARE FOR THE WELL-BEING OF THE WHOLE PERSON - BODY, MIND, and "SPIRIT". Persons can't VIOLATE a person's MIND and SPIRIT, and expect their HEALTH not to SUFFER. Those that dare keep insisting upon or pushing to VIOLATE the bodies of others against their will need to be REMOVED from their posts from which they work/ would dare work ABUSE OF POWER, to work such HEINOUS and LIFE-DAMAGING/ DESTRUCTIVE CRIMES AGAINST GOD and HUMANITY. My guess - like many others - is that some forced vaccines are and/or can be used for DE-POPULATION agenda purposes, by evil, conscienceless, wantonly spiritually ignorant/ God-defiant, and short-sighted fools.